For Cilantro Lime Rice, heat a tsp of butter or ghee in a pan. Add 2/3 cup basmati rice and juice of a lime. Stir to mix, then add as much water as your package dictates and 1/2 tsp of salt. Most basmati rice varieties should be okay with double the quantity of water. Bring it to a boil, then cover and simmer until the water is absorbed. Add 2 tsp of chopped cilantro and mix. The black beans are what I am most excited about. Soak 1/2 a cup of beans overnight. Next morning, cook them with plenty of water in a pressure cooker until tender. Combine a small capsicum, halved and seeded with a small chopped onion, a clove of garlic, 1/2 tsp dried oregano, a tsp of cumin seeds and little of the cooking water from the beans in a blender. Blend until you get a smooth mixture. Drain the beans but leave around a cup of cooking water in there. Add the blended mixture, salt, a tbsp of white wine, a tsp of vinegar and 1/2 a tbsp of olive oil. Simmer until the beans are thick. Guacamole is just a ripe avocado mashed with finely chopped jalepeno, chopped onion and cilantro, salt and lime juice. I never measure any of these, just going by what seems right for that day. Salsa is also just a mix of chopped tomatoes, onions, salt and lime juice. I'd usually put in cilantro too, but figured we already had enough of it in the guacamole. And sour cream is well, sour cream. 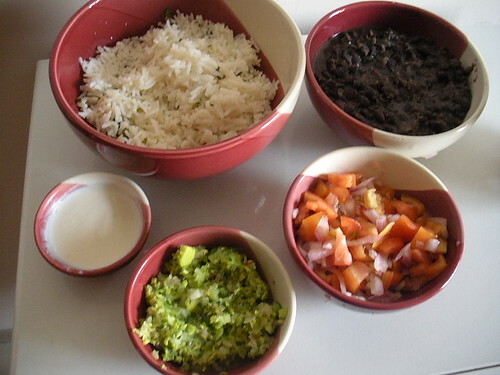 Once you have everything in place, add whatever you like from the mix to rice. Can i bribe you for the cilantro rice recipe at least? Like Ann above, I am ready to bribe you for this chipotle burrito bowl too :) I have been craving mexican for last few days, I think I am going to bite the bullet and make some tacos this weekend. Waiting for the recipes, not so patiently! Hello.... Even m from Mumbai... heard tht there is a bloggers meet when is it nd where?? ?